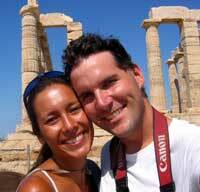 August 8-14, 2005 -- We have departed for the Greek Islands after a lovely 1 month adventure in Turkey. Hurray, time to discover another country!! We battled our way up the coast to the small island of Simi. Summer weather systems are known to produce high speed winds called the meltemi. In a matter of minutes, a perfectly calm sea can be whipped up into white-capping waves, your hair develops the most unbelievable knots, and tears start streaming from your eyes. Now I think that I have a little better idea why Odysseus’ journey took so long! For a little better idea, check out the TMD production of “What is the meltemi?“ in our video section. A perfect little bay sheltered us from the worst of the meltemi. Cool and clear aquamarine water led up to barren hillsides of stone. Dotted around the bay were brightly painted houses draped in fuchsia bougainvillea and built in neoclassical style. The shore was lined with colorful fishing boats. The boats look child-size, like playthings, but the weathered fishermen putter around like sea admirals. Now this is exactly how I pictured the Greek islands to be! We headed in to explore the island by hopping on the local bus. These narrow streets were obviously not intended for buses. There must be only a foot on ach side of the bus as we lumber down twists and turns. It looks like our bus driver knows everyone on the island. He keeps waving, honking his horn, while simultaneously talking on his cell phone! By some small miracle, we arrive safely in the main harbor town. We are here to check into Greece which means a visit to customs & immigration, the police station, and the harbormaster. Other than that, we are free to explore this tiny island. Simi seems to be quite the tourist destination. While we are in town, two large ferries come roaring into the harbor to unload masses of tourists. 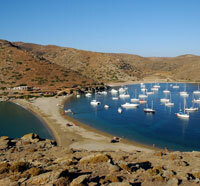 The harbor is surrounded by a little village tucked into the hillside. 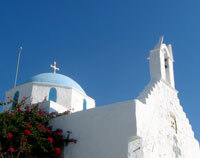 There are churches everywhere with domed roofs painted to match the intense blue of the Greek sky. Simi is known for its sponge divers. Years ago the young Greek men would free dive 30-40 feet with nothing more than a pair of goggles and a knife to collect the sponges. Today, they are fully kitted out with scuba gear and must descend even farther. No time for relaxing strolls down the cobblestone streets of Simi. You must always be on the lookout for mopeds that seem to continually have tourists in their line of sight. After morning of exploring it was time our first official Greek gyro (much like the Turkish doners, only tastier) and it was absolutely delicious. Top it off with some decadent ice cream and you have a happy crew. Our next stop was the island of Yiali. Not necessarily the prettiest stop with us anchored just outside a quarry, but great shelter from the meltemi that was raging for the next few days. It allowed us to pop over to the island of Niseros which is known for its volcano. 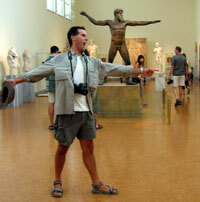 According to Greek legend, Poseidon was chasing another god called Polybotes across the Aegean sea. Poseidon broke off a piece of Kos island with his triton and hurled it at Polybotes. The unfortunate deity was trapped under this piece of land creating the island of Niseros. This explains the volcanic activity of the island which is attributed to the sighs and groans of Polybotes. We braved the choppy seas for a 30 minute sail over to Niseros. Then we dropped our dinghy in the water so that David, Donna, and I could explore the island while Dave stayed on Exit Only. The small harbor was so rolly that it took us a good 30 minutes just to find a place to tie up. We hopped on a bus tour up to the crater of the volcano. The last time the volcano erupted was in the 15th century. Thankfully, the volcano is dormant but still emits fumes. 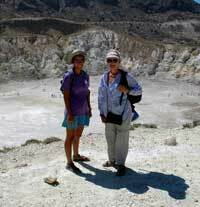 We were able to hike right down into the blown-out crater. The further one descended into the crater, the stronger the smell of rotten eggs (sulphur) became. Pot holes in the crater were filled with bubbling mud and crusted with yellow crystals. Here and there, steam would rise from the ground in chaotic bursts. You kind of have to be careful where you step or you could end up with a scalded foot. Ouch! One sore foot later, I can officially say that I have been inside a volcano! After our volcanic tour, we wandered the streets of Niseros. 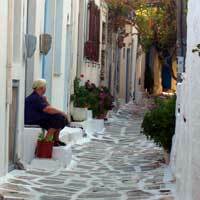 Charming houses lined narrow walkways. Flowers spilled out of window sills. And children raced up and down the street. The meltemi, our tenacious foe just will not give up. We were hoping to head further north and west as we make our way towards the Corinth Canal, but the winds whipped up again. We were forced to divert to the island of Kos. A fortuitous stop in my book, as we explored the birthplace of Hippocrates, the father of modern medicine. Guess that must just be the medical professional in me talking! Not a lot is known about Hippocrates, except for a few texts attributed to him and a biography written by a Roman physician nearly 200 years after his birth. Hippocrates was the first medical professional who attributed diseases to natural and biological causes instead of magic. That meant that diseases could be treated and cured with natural elements, not witchcraft or magic. In Kos town, we were able to visit the ancient agora (central meeting place for business) where in all likelihood Hippocrates walked around with a stethoscope meeting his patients. Hmm … maybe my imagination is getting ahead of me. They even have a plane tree here that Hippocrates supposedly taught under (what they fail to mention is that the plane tree only has a life expectancy of about 200 years). 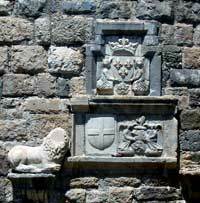 The other site to visit in Kos is the Castle of the Knights. This fortress is absolutely huge with walls that must be 6 feet thick! In order to build such a large castle, the knights pillaged the ancient Greek ruins throughout the city of Kos. So it is not uncommon to see Corinthian capitals and other pieces of stone worked into the castle walls. I don’t know exactly how to give you an idea of just how large this fortress is. Let’s just say that it covered the area of a football stadium! The castle sits overlooking the water towards Turkey. The castle was built in the 14th century by the Knight’s of Saint John as a defense against the advancing Ottoman empire. It looked fairly impregnable with its deep moat, thick outer walls, and inner keep. The knights just weren’t counting on the earthquake in 1495 that damaged the castle!! Now the only people that the castle tries to keep out are the tourists that swarm around the harbor front. Ah, the meltemi has finally settled down so we are heading for points northwest. Our itinerary is pretty much wherever the wind blows us. 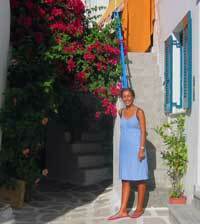 August 15-27, 2005 -- From the island of Kos, we slowly made our way across the Cyclades. These are desolate, yet beautiful islands that stretch across the Aegean sea. Our direction and progress was largely determined by the meltemi winds. Every morning, we would wake up (or rather I should say that Dave woke us all up) at 5 AM. The coast was clear with not a ripple on the water, and we would be off for a morning of sailing until the meltemi winds would begin to howl. Then it was time to seek shelter wherever we could. At many small anchorages, there would be 5-10 boats squeezed into a small bay or inlet seeking shelter from the wind. Most of these boats were charters which generally meant that the people on board didn’t have a clue about sailing or anchoring a boat. It could make for some hilarious, but also frustrating moments. Charterers would come zooming into the peaceful cove we had found, drop their anchor without looking to see if the anchor was holding, hop into their dinghy and zip over to the taverna restaurant, then return to their boat for drinks and blast techno music into the wee hours of the morning!! In our month and a half in the Med, we have learned that the Italians seems to be the most intrepid charterers. Their sailing and anchoring skills may not be the best, but they sure know how to party! 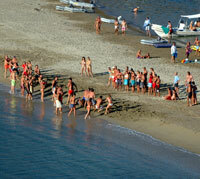 At one particular anchorage, there was a charter fleet of 10 Italian sailboats (approximately 60-80 people). Somehow or another they managed to use every inch of useable space our small bay. Then they all headed for the beach where they had a lively game of tug-of-war! 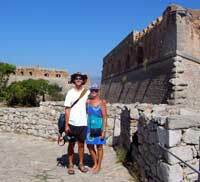 Hopping across the Greek islands, we stopped at Levitha, Amorgos, Paros, and Kythnos. 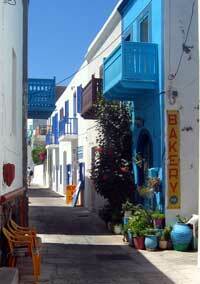 Of these islands, Paros was probably my favorite. It perfectly fit the picture of the Greek islands that I had in my head. A bustling little seaside town framed by small fishing boats with a backdrop of steeples, colorful shuttered windows, narrow streets, and small shops. I am really starting to admire the Greek sense of style. Although their homes are simple in construction, they pump up the charm with delicate lace curtains, shutters and doors painted in vibrant colors, blossoms exploding over windows and fences, and cheerful tables and chairs that beg for you to sit in them. The prettiness of the town has made it quite popular with tourists, so there were ferries cruising in and out of the harbor at all hours of the day. 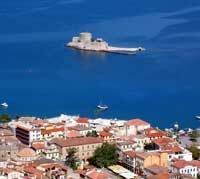 David and I wandered all over the town exploring the different neighborhoods, discovering the remains of a Frankish castle, visiting a small church overlooking the ocean, pressing our noses against the window of the pastry shop, and enjoying a yummy gyro! Well, from the Cycladic Islands, we headed towards mainland Greece -- Attica. Nearing the headland, we were greeted by the Temple of Poseidon sitting high on an outcrop overlooking the Aegean Sea. It was an encouraging site for ancient mariners to glimpse this huge white temple glistening across the sea. We were able to anchor just underneath the temple and then hike up to it. The temple was built in 444 BC. It was destroyed during the Persian invasion and then rebuilt with fortress like walls around it. Over the years the temple tumbled and collapsed from earthquakes and invasions, only to be rediscovered by tourists in the 19th century. All that is left of the temple now are a few large columns and the foundations. They say that Lord Byron was so moved by the sight of the temple that he composed a poem. And somewhere on one of the columns you can even find his handiwork. From the Temple of Poseidon, we headed for the island of Aegina. This island is home to thousands of Pistachio trees. 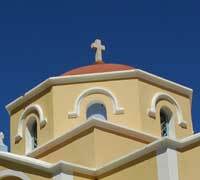 Only 20 km from Athens, we made Aegina our base for a trip into the city. David and I had our own little adventure on the side into Athens since Dave and Donna had already visited the city a number of years ago. It ended up being one of our most expensive days in a long time. From Aegina, we hopped on the local bus to the ferry station at 7 AM. We arrived just in time to see our ferry depart!! So we opted to take the hydrofoil instead!! 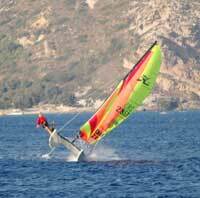 What an amazing ride, zooming across the water at 40 MPH!! A mere 40 minutes later we swooped into Piraeus, Athens main harbor. It was choked full of cruise ships, ferries, hydrofoils, fishing boats, and cargo ships. Up ahead of us rose the city, already under a layer of haze and smog despite the early hour. Navigating Athens was a breeze! They have a great new metro system completed in time for the Olympic Games. On the way into the city, we were even able to glimpse one of the Olympic stadiums. I shudder to think what the city must have been like with the Games in full swing … crowded streets, packed restaurants, annoying vendors! 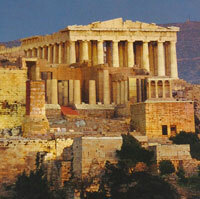 The Acropolis has been a city for over 3000 years and a center for philosophy, literature, drama, art, and religion. According to Greek mythology, the gods of Olympus decided that the city should be named after the god who could produce the most valuable gift for humanity. Athena produced an olive tree, symbol or peace and prosperity. Poseidon struck the ground with his trident and created a horse, symbol of strength and fortitude. The gods proclaimed Athena’s gift would best serve the Athenians, and so the city became Athens. During the Golden Age (4th century BC), Athens became the pet project of Pericles who beautified the city in with many of the monuments that are there today. The Acropolis was the religious heart of Athens with multiple temples and also a large treasury that held all the wealth collected from temples across Greece. 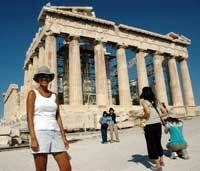 Over the centuries, the Acropolis has been destroyed and rebuilt a number of times. The city endured foreign invasion, earthquakes, fires, archeologists, shoddy renovation attempts, and tourists. I have even read that the Venetians attacked the Turks here causing a gunpowder store to explode inside the Parthenon!! And despite all this, the city on a hill continues to shine! The main entrance to the Acropolis took us through the Prophylia and the Temple of Athena Nike. Stately steps lead up to massive Doric columns and the gate to the Panathenaic Way. The crowds here were ugly, forming a slow and shuffling line into the city. The Prophylia was covered with scaffolding undergoing a major renovation to correct mistakes of the past. 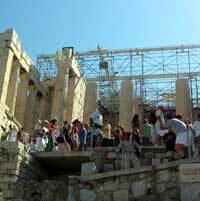 Come to think of it, most of the Acropolis seemed to be a major construction site. There was scaffolding everywhere!! Unfortunately, this meant that many of the monuments were hidden from sight. 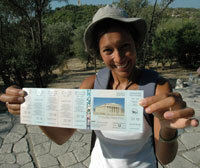 The Panathenaic Way was the main road through the city. Every year the Athenians had a major party and parade down this road to honor Athena. It used to be lined with beautiful marble statues. Next up was the Parthenon, the largest Doric temple ever completed in Greece. Parthenon means “virgin’s apartment”. 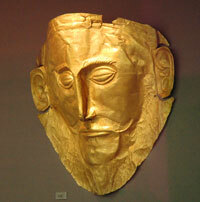 The temple housed a large 12 meter statue of Athena made out of gold, ivory, and precious jewels. The Parthenon also served as the treasury for tribute money. Across the way was the Erechtheion, the place where Poseidon stuck the ground to create a horse and where Athena made an olive tree grow. A smaller temple was built here with detailed statues of maidens used as columns. One audacious tourist step over the barrier and started to walk all over the patio of the temple. Within 30 seconds, whistles were going off right and left as a very chunky monument guard ran up. She started shaking her finger at the tourist and berating him loudly in Greek! Pretending to feign ignorance, he hopped off the monument! From the heights of the Acropolis we went down to the Roman and Greek Agoras. This was where all the movers and shakers would meet for business, administration, and social activity. Little is left now besides a column here and an arch there. This is the place where the Apostle Paul came and discussed Christianity with the Athenians. 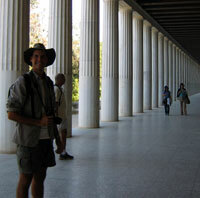 We visited the Stoa of Attalos, a completely renovated monument. It was reconstructed by the American School of Archeology. Two stories tall with 54 columns of pentelic marble, it used to be painted blue and red. The stoa housed expensive shops where the wealthy Athenians would come and hang out. 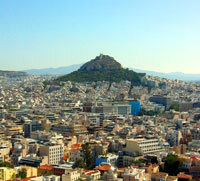 Surrounding the Agora today is the modern neighborhood of Plaka. Archeologists would love to tear this whole place up and discover more remains of the ancient Greek city. 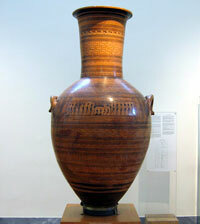 From Plaka, we headed for 2 museums -- the Museum of Greek Popular Instruments and the National Museum of Archeology. The music museum was a fun stop and had some beautiful instruments -- drums, bells, violins, bagpipes, lutes, and flutes. David had a fun time listening to a wide selection of recordings. From there it was a long walk through the Plaka neighborhood and up to the National Museum of Archeology. What an amazing museum filled with treasures from the Neolithic Period through the Hellenistic Period. Statues, pottery, jewelry, frescos, mosaics …. 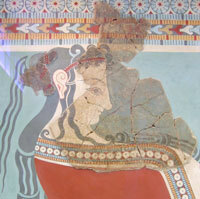 High on my list were the Minoan treasures with colorful frescos and gold jewelry. 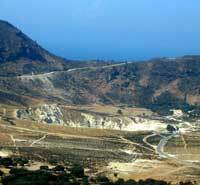 Based out of Crete, the Minoan civilization reached its peak around 2000 BC, only to mysteriously disappear 1000 years later. Some people think that the major eruption of the Santorini volcano and ensuing tsunami may have been to blame. The frescos only survived in bits and pieces. 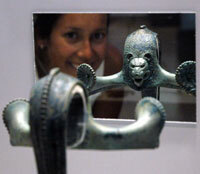 They were reconstituted by archeologists who were pretty liberal in their interpretation of the designs. Other interesting pieces included a bronze statue of a woman only recently found in the waters off Simi Island (our first stop in Greece) which we were not aloud to photograph. Then there were the lifelike statues and busts which dated from the Classical Greek to Roman years, every day items such as mirrors and door knobs, and intricately painted ceramics. All in all, I would have to say that these people were living fairly well. Athens was another great adventure on the side. If we had more time, I would definitely have given the city a closer inspection. But our feet were getting tired, it was getting late, and it was becoming just a little to expensive to hang out in Athens much longer. 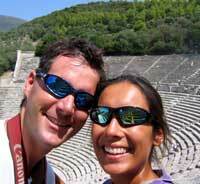 Back on the boat, we headed for the small town of Epidavros on the Peloponnese peninsula. Donna who has been to Greece before wanted us to the visit the world heritage site of ancient Epidavros which centers around the amazingly well preserved amphitheatre there. They continue to use the theatre today for Greek tragedies, Shakespearian drama, and musical concerts. A quick ride on the local bus and we had arrived. In truth, I would have to say that the amphitheatre was a bit of a letdown after seeing the theatres of Ephesus and Heiropolis. This amphitheatre could only seat 14,000 people (much less than Ephesus) and it had none of the stage intact (like what we saw at Hieropolis). Its only claim to fame was its “perfect” acoustics. According to a popular guidebook, the acoustics are so good in the Epidavros theatre that you can drop a coin on the center stage and it can be heard perfectly throughout the entire audience. Needless to say, there were a few people tossing coins about to test out this theory. 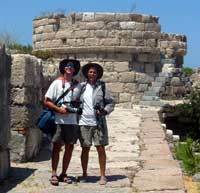 Our other excursion in the Peloponnese was to the Venetian city of Nafpoli. In the 15-17th centuries, the Venetians had a trading empire that spanned the Med. They had a very large presence in the Greek islands. The Venetians built many towns and massive castles to defend their trade routes. 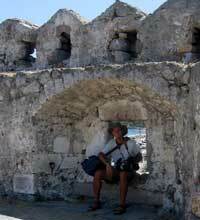 Nafpoli had 3 Venetian castles guarding the harbor and town. And so the architecture is completely different from what we have been seeing in the Greek Islands. It almost felt like we were walking through the streets of Venice. 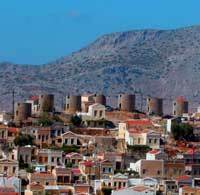 The Palamidi castle sits high on a hill overlooking the harbor. You have the option of either climbing the 999 steps or driving up to the top. We opted for the less rigorous taxi ride up the hill. A marvel of military architecture, the Palamidi fortress was divided into several separate bastions which made it nearly undefeatable. It also served as a prison during the Greek war of Independence. After our morning at the castle, we spent the afternoon wandering through the town and sampled some delicious gelato ice cream. Well, we are off for the Corinth Canal now. We had horrible head winds early in the morning, so we had to turn back. We made a second attempt a little later on and made it to the canal entrance. 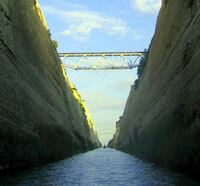 The Corinth Canal transits the narrowest part of Greece. 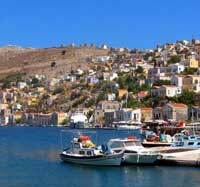 The isthmus is only 3 miles wide and has been used for hundreds of years to avoid sailing around the Peloponnese. In ancient times, they actually would haul boats out of the water and have slaves drag the boat across the isthmus. The Roman emperor Nero attempted to dig a canal with 6000 Jewish slaves, but it wasn’t until the end of the 19th century that a true canal was completed. It is the most expensive waterway in the world!! As we waited to go through the canal, we watched cargo ships, cruise ships, mega yachts, and sailboats transit the canal. Steep cliffs rise up 200 feet on each side. You can see the places where there has been erosion. On exiting, there is even evidence of the Roman attempt – a small chapel-like structure with a statue. And suddenly, we have popped into the Gulf of Corinth. There are rugged mountains, villages, vineyards, and beaches on each side of the gulf. Just another 120 miles and we will be in the Ionian Sea heading for Italy. 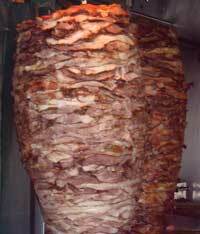 Say hello to the Gyro!! Quiet streets of Niseros town. 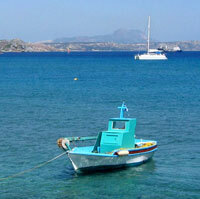 Small, but robust fishing boat at Kos. Meltemi winds make for an exciting ride! There's no place like a castle!! Hmm, how many pairs shall I buy? Very cool looking, but what is it?